Original Sin, producers of a highly thought of apple cider since 1997, has added a pear cider to its lineup. 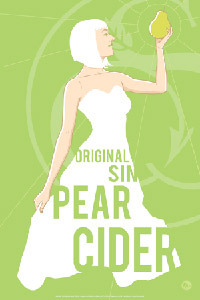 Original Sin Pear Cider is a dry cider, a modest 4.5% abv, and is gluten free. In 2003 a tasting panel for The New York Times judged Original Sin Apple the “top American cider” in a test involving 21 ciders. Original Sin is available in 22 states, recently shipping to the West Coast and to the United Kingdom. Rock poster artist, R. Black, has created a series of posters for Original Sin featuring models from New York City’s nightlife and art scene. The posters, some more provocative than the one (left) created for Pear Cider, are for sale at the company website.